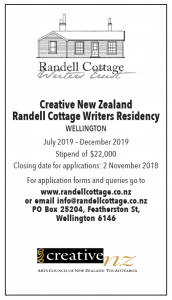 Please RSVP to info@randellcottage.co.nz or call Robyn on 4758 155 evenings by 19 October. 8. Receive and consider the following recommendation from the Committee of the annual subscriptions for the year (2018/19): that subscriptions for 2018/19 remain at $15.00 for seniors/students, $30.00 for individuals and families and $60.00 for businesses as set at the 2016 AGM. President: The Chair of the FRC Committee, Sian Robyns, has expressed her willingness to be nominated as President again. Treasurer: Tracey Schuyt has expressed her willingness to be nominated as Treasurer. Secretary: Robyn Skrzynska has expressed her willingness to be nominated as Secretary again. Tim Gruar and Linda Burgess have expressed willingness to be nominated as members of the Committee. Note: Any other nominations for President, Vice-President, Treasurer and Committee, with details of seconders (if any) and evidence of the willingness of the nominee to serve should be emailed to the Secretary at info@randellcottage.co.nz in advance of the meeting.